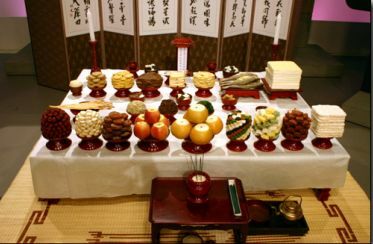 추석 (Chu Seok) is one of the biggest Korean Holidays. It’s on the 15th of August in the lunar calendar. It’s in the middle of Autumn and celebrates the harvest. We have a ceremony to pay respect, we are thankful to our ancestors and nature. When 추석 (Chu Seok) people dress up in traditional clothes – 한복(han-bok), family and relatives travel from all over the country and gather together, have a big feast, play some folk games and spend time together. The origin is similar to American Thanksgivings and is an important holiday like Christmas. 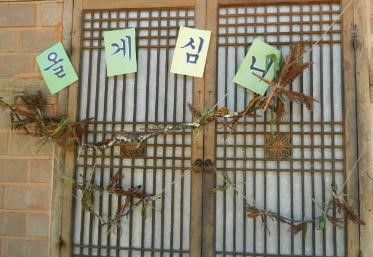 올게심니(Ol-ge-sim-ni) is traditionally what farmers did. People put an ear of rice or other grains on the pillars or door frame as an offering to spirits of nature. People also invited neighbors and prepared food and drinks as well. Another tradition is 차례(Cha-rye). All of the family gather together and dress up in 한복 (han-bok/Korean traditional clothes), offer food with fresh ingredients to their ancestors. After the ceremony, people usually have a feast with the offerings and some more holiday food. Taro and beef soup, savoury pancakes, beef and vegetable skewer, pine mushrooms and chicken dishes are traditional Chu-seog food. 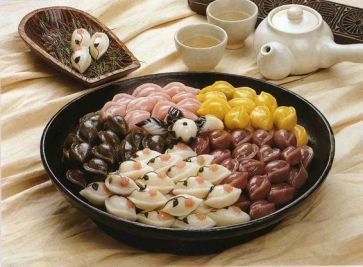 Especially 송편 Song pyeon is one of the typical 추석 Chu-seok foods. It’s a rice cake filled with different grains like sesame, chestnut, jujube, moong bean and dried persimmon. Steamed with pine tree leaves. On 추석 Chu Seok, Koreans play many folk game like 줄다리기 rope pulling game, 소놀이 Cow game, 거북놀이 Turtle game. 강강술래 Gang gang sul lae is circle dance. Many girls hold hands and circle under the 추석 Chu seok moon. This 추석 Chu seok, I invited my students to have Korean food and play 윷놀이 play together. 윷놀이 is a traditional Korean board game. I hope we could play again on 설날(seol-nal/ New Year’s Day ). Click here for articles on how to make 김밥(Korean Seaweed Roll), Korean Movies, Traditional Wedding and more. How to make home style비빔밥 Bibimbap in 10 mins.